It is a transparent texture material for the finishing of walls which refracts the sun's rays after its application and requires special preliminary preparation of the walls for high-quality result. Polished plaster is a kind of decorative walls, in the mixture which includes limestone or acrylic binder and marble powder. It has a transparent texture, making it possible to achieve a unique play of light. After its application, the surface is finished to a smooth glass-like sheen with a special trowel, and also is covered with a protective layer of wax. As a result, the surface becomes strong, waterproof and vapor-permeable and can be washed if necessary. Application to concrete, wood and brick is possible. The main requirement is that the surface on which it is applied, has been well prepared. Otherwise, cracks and irregularities can be seen, which will significantly spoil the expected decorative effect of marble imitation. Regarding to this, special skill of a qualified specialist in case of cladding works is required. There are many varieties of polished plaster: from Venetian to strong textured plaster, as well as Marmorino. It can look not only as polished marble, but also as travertine or limestone. It is mainly applied over a primer and basecoat base from one to 3-4 times. There is an acrylic and lime mixture depending on the constituent of the binder. About 40% of the marble powder can be a part of polished plaster with a limestone binder. Depending on the ingredients of the mixture, the following types of Venetian plaster are distinguished. It looks like polished marble. Has a balanced correspondence of the price and quality of the material, as well as a relatively simplified application. Wax is applied to the plaster layer, so that the surface can be washed. It looks like a polycrystalline rock called travertine, has the view of polished marble. The component of the mixture is a polymer, which gives many variations of shades to the plaster. It looks like a rough-worked antique marble. Has a velvet surface, looks great with polished glossy streaks. It looks like polished marble with dark terracotta impregnations or like granite. The last layer is covered with wax. Has a translucent texture, contains a golden pigment. 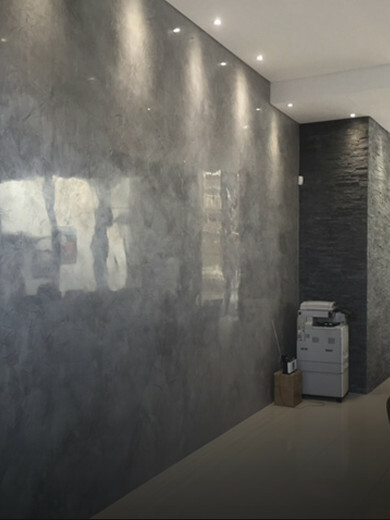 Polished plaster has an exclusive design and aesthetic appearance, watertight, fire-resistant, durable, wear-resistant, odorless, doesn’t contain harmful toxic substances, quickly dries. The use of light and paints in combination of several colors helps to create a unique interior decoration. This material can be used in rooms with a high humidity level, and can also be easily cleaned with a damp cloth due to the ability to repel liquid without absorbing excess moisture. However, this type of plaster has a complicated process of application and high cost. The long and time-consuming process of applying this material to the wall visually creates an unusual depth and glow in the reflection of light, so the ending result justifies the costs. Thus, the disadvantages include the cost of materials and the complexity of the work.